Danny Peterson | 12/4/2018, 4 p.m. Volunteers with Critical Resistance Portland have a home in a new community gathering space open to multiple social justice organizations and communities of color at 14 N.E. Killingsworth St. Pictured are Mohamed Shehk (from left), Anna Swanson, Myell Thompson and Cory Lira. A new public gathering space for multiple organizations to share and one geared toward social justice issues and support for communities of color is giving various non-profit groups a better way to consolidate their limited resources and make a bigger impact. The Dismantle, Change, Build Center (DCBC) is the newest designation for the old storefront at 14 N.E. Killingsworth St. The stewards behind the center are attempting to operate it within the spirit of how the space has historically been used: To provide a culturally diverse and enriching gathering and organizing space for community members in the tradition of the former Albina Arts Center, and later, In Other Words feminist bookstore, two organizations the space formally housed. The importance of holding a shared stewardship of a community space is seen as both a logistical one in terms of cost sharing and for the ability to build on the number of voices who advocate and envision a better future for their stakeholders in the community, according to Anna Swanson, one of the organizers of the center, a volunteer with the group Critical Resistance Portland. “We’re taking the opportunity to be the future that we are working to create by holding this space, holding it collectively, living that sort of shared vision of sharing resources, not treating anyone as disposable, having a space that's really oriented around that,” Swanson told the Portland Observer. Critical Resistance Portland is a chapter of an international movement dedicated to the abolition of what it calls the “Prison Industrial Complex” through activism work. Their efforts are often geared toward advocating for the reallocation of resources from things like prisons and police to services for things that can fulfill the basic needs of community members, like affordable housing, health care, mental health care, and education. 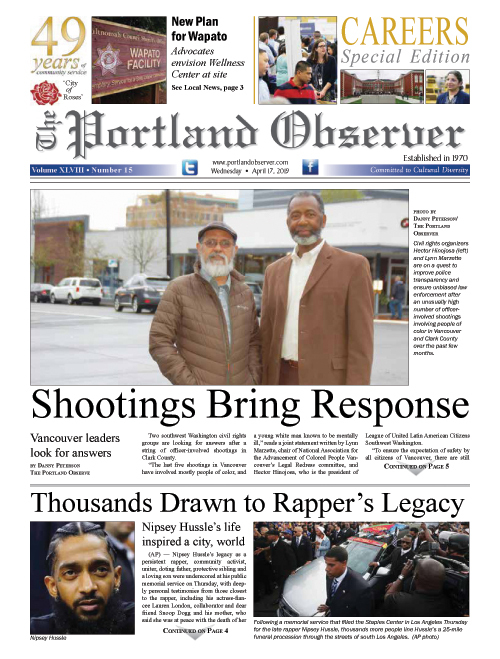 Mohamed Shehk, visiting communications director for the national Critical Resistance organization in Oakland, California, told the Portland Observer that advocates for the group see most of the existing polices around policing and law enforcement, for example, as ineffective tools against crime that fail to solve bigger problems. “The Prison Industrial Complex is a term that we use to describe the inner-locking systems of policing, imprisonment, surveillance, and the intersection of interests between government and industry that use those systems as solutions to problems that are actually political, social, economic in nature,” Shehk said. United States’ disproportionate housing of the world’s prison population, and in particular of communities of color within the U.S., has been a contentious political issue. Civil rights leaders in Portland and nationally have called for changing laws for better fairness, drawing support from liberals like Vermont Senator Bernie Sanders to former President Barack Obama, who commuted or pardoned 1,927 people for federal crimes, mostly for drug charges, by his last term in office.